As you can probably tell from my recent articles on Álamos and Mazatlán, I’m spending a good bit of time rediscovering Mexico. In some ways, it’s like becoming reacquainted with an old friend. Mexico is, after all, a neighbor and culturally similar to the United States. Americans and Canadians can drive to Mexico, the food is among the best in Latin America, and prices are good in many Mexican markets right now. When I first arrived in Mazatlán, I made up my mind pretty quickly that Mazatlán’s Centro Histórico was the place for me. Although there are expats and tourists in Centro, much of it still has a homey, Mexican, nontouristy feel. But then I looked at a half-dozen or so seafront properties in Mazatlán’s beach neighborhoods… and now I’m not so sure. The last apartment I looked at was right on the sand, had a straight-on view of the islands, and was in a luxury building that’s perfect for whale watching. Yes, most of the beach areas are more touristy than Centro Histórico. But, for that view, I could put up with quite a few souvenir shops and tourists in safari jackets. Located on Mexico’s Pacific coast within driving distance of the western United States, the main attraction in Mazatlán is almost 20 miles of beautiful beaches bordering the deep blue Pacific. It’s true that the nicely restored historic center has gained markedly in popularity, but, in Mazatlán, the beaches still reign. 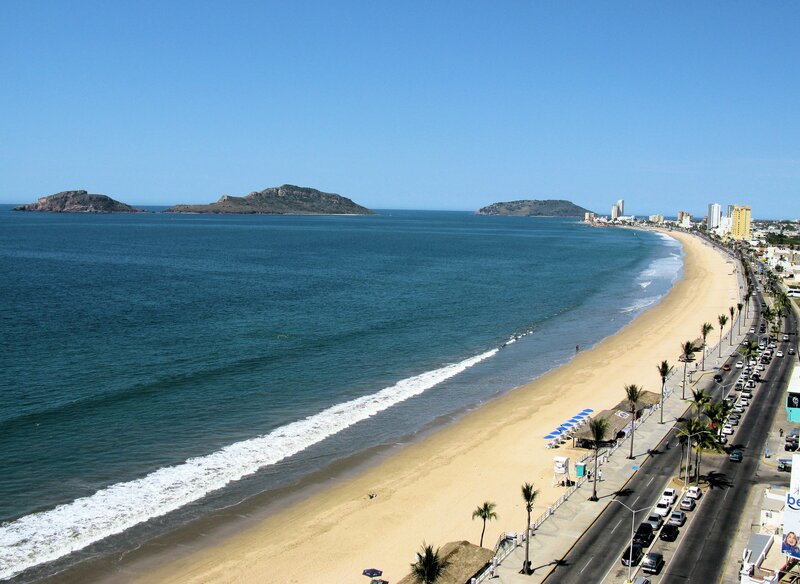 Prices for seafront properties are good in Mazatlán, by North American and most Latin American standards. And, recently (as we discussed in last week’s issue), the interaction between the U.S. and Canadian dollars has resulted in some properties trading at an additional 20% discount when compared to just two years ago. The resort infrastructure is good here, with plenty of restaurants, cafes, shopping, and nightlife. You can dine in an elegant Italian or Spanish-restaurant, spend a day on the water fishing, boating, diving, or snorkeling, or just relax and watch the dolphins offshore. 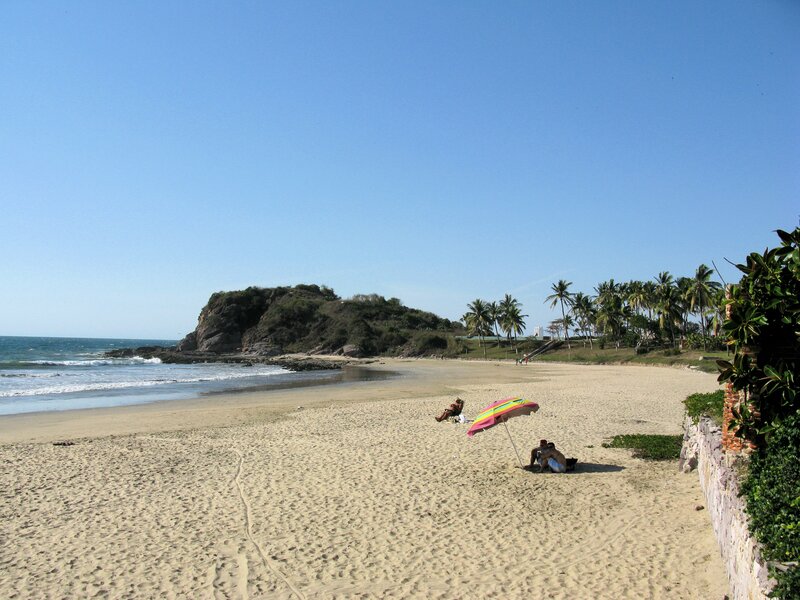 The weather in Mazatlán is perfect during the North American winter, with warm days and cool nights. The location you choose is entirely a matter of personal preference, so your favorite areas will likely differ from mine. 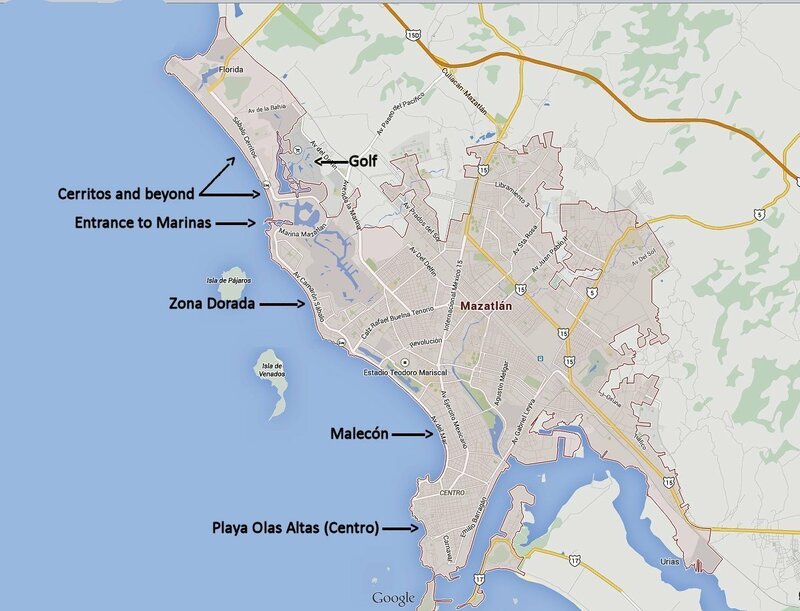 Your best location depends on what you’re looking for in a property in Mazatlán and whether you intend to rent it out. Here’s my take on Mazatlán’s most popular areas for expat buyers. To get a feel for orientation, take a look at this map of Mazatlán’s beach zones I marked up from a Google Earth image. As you consider the different sectors, keep in mind that Mazatlán has a good system of public transit. There are buses, traditional taxis, and dune buggy-like vehicles called pulmones. We covered Mazatlán’s historic center last week, so I won’t discuss it again here. Suffice it to say that Mazatlán’s Centro Histórico is a good option for those who enjoy a Spanish-colonial environment in close proximity to the beach. This is an area that connects the Centro Histórico to the Zona Dorada. Malecón is somewhat less developed than either of its neighboring areas. The term “malecón” is a bit misleading because technically in Spanish it means a seawall, pier, or breakwater. In practice, malecón is more often used in parts of Latin America to mean the waterfront road or a seafront promenade. In Mazatlán, in addition to the preceding two meanings, it’s also a sector of the city that runs along the beach between Centro and Zona Dorada. In my view, Malecón has the nicest stretch of beach in Mazatlán proper (it includes both Playa Norte and Playa Camarón). The beach runs for almost 3 miles (4.7 kilometers), all walkable, with much of it remaining relatively uncrowded and noncommercial. Malecón is somewhat less walkable than the Centro Histórico or Zona Dorada, but the north end of it is within walking distance of the area’s largest mall, biggest gym, and supermarkets. In summary: Malecón is the best area for the beach lover. While it’s walkable to fewer restaurants and shops than Centro Histórico, it has access to mile after mile of relatively uncrowded beach and is just a few minutes to either the Centro Histórico or the Zona Dorada. This is the main tourist and hotel sector in Mazatlán. It’s dense with shops, boutiques, cafes, and restaurants, as well as a multitude of things to do. I believe it’s the most walkable sector of the Mazatlán metro area. Zona Dorada is fun and convenient. But it also draws the most tourists and the annoyances that come with them, like hawkers selling their wares or tour guides chasing you for your business. These things are to be expected when you’re visiting a tourist area, but they can become annoying to a resident. You’ll see less of this type of thing at the north and south ends of Zona Dorada and more of it in the center. To complicate the picture further for the second-home buyer, this is also the zone that rents the best (better than Malecón or Centro). It rents both to international visitors as well as to wealthy Mexicans. In summary: Zona Dorada is where you can walk to the most beaches, restaurants, shops, and diversions in the city. And, while the tourists can bring tourist annoyances, here is where you’ll find the best rental occupancies and rental returns. The marina district is an exclusive area built around a well-designed network of waterways, golf courses, and marinas. It consists of some mature neighborhoods and also some fairly undeveloped areas, along with a handful of restaurants and cafes. The southern part of the marina district is adjacent to the north end of Zona Dorada, and fairly convenient to its restaurants, bars, clubs, and shopping. The north end is more isolated, thanks to a long loop that the highway takes to get to the north side. The north side of the marina district is best for those who want more peace and less traffic, while the south side is better for those who want to be nearer to all the action. All of it is great for boaters. In Summary: The marina district is perfect for boaters or those who like the boating and golf atmosphere. There are a lot of waterfront properties here selling for much less than properties on the ocean. Even if you don’t have a boat, you’ll enjoy sitting on your back porch and watching the boats passing by. Once you get beyond the marina district, you’ll find a more tranquil setting with high-end resort condo developments offering plenty of on-site amenities. The amenities here are important because these are not walkable properties—it’s about 10 minutes’ drive from Cerritos to the thick of the Zona Dorada. This is also a good area for golf enthusiasts. I thought this would be an undesirable area for a vacation rental… but I was wrong. The area is indeed quite popular with well-off Mexicans who come here during the hot summer months of June through August, looking for more tranquility than they’d find in the more commercial areas. In summary: Cerritos is for those who like more peace, less traffic, and a quieter atmosphere or those whose priorities include access to a golf course. This is a pretty good area for rentals too, with good off-season occupancies. In the Malecón sector, one of my favorites was in the Horizon Sky building. It’s an elegant, classy condo building with good community facilities. And it’s right in the middle of a long stretch of uncrowded beach. I looked at three units here, and I think the most popular will be apartment 902—a two-bedroom, two-bath unit of almost 1,650 square feet (152 square meters), built in 2009, with a wide, unobstructed view of the ocean and sunset. The asking price is US$260,000. I took the long-view beach photo above from the balcony of this unit. Again in Malecón, we looked at a furnished apartment in Las Gavias Residential, also on the beachfront road. What I liked about this building is that it’s not only on the same long stretch of beach but it has a tunnel that goes from the buildings lower floor, under the roadway, directly to the beach. It’s like having a right-on-the-sand property without paying the high price that comes with it. This one had two bedrooms, three bathrooms, granite counters, and a living area of 1,415 square feet (131 square meters). The asking price is US$233,000. In the Zona Dorada, we found a great buy that would make a good rental, with one bedroom, one bath, and 807 square feet (75 square meters). The taxes on this one are only US$167 per year at today’s exchange rates, and the asking price is US$175,000. In the Marina District, here’s a good example of what you’ll find. It’s a luxury, three-bedroom, three-bath condo that comes with a private yacht club membership—all for US$280,000 at today’s exchange rates (4.24 million pesos). Take a look at the waterfront condo here (http://www.solutionsmazatlan.com/Mazatlan/Sinaloa/Condos/Marina_Mazatlan/Agent/Listing_91106321.html). In Cerritos, I particularly liked an apartment in Quintas del Mar. The original owners combined two apartments to make one large, 1,750-square-foot (163-square-meter) condo. It has four bedrooms and four baths for an asking price of US$230,000. Even though it’s directly on the beach, the taxes are only US$227 per year at today’s exchange rates. My real estate contact in Mazatlán is Shaun Klynstra, an expat in Mazatlán since 2002 and founder of Solutions Mazatlán, a real estate and property management firm. Shaun and his young family live on the beach near the Centro Histórico. You can reach him at shaun@solutionsmazatlan.com, or call 1-877-282-0864 from the United States. He’s got inexpensive properties too, down to around US$34,000. Be sure you don’t miss the peso-priced properties on his website. You can take a look at his entire inventory here (http://www.solutionsmazatlan.com/). Are Mazatlán’s Beaches For You? If you’d like to settle into a Mexican town and immerse yourself in Mexico’s untainted culture, then there are better places for you than Mazatlán’s beach zones… even Mazatlán Centro would be closer to the mark. But, for the beach lover, Mazatlán is a mature, well-appointed resort city. It offers miles of attractive beaches with blue seas and warm waters. The weather is brilliant, sunny, and comfortable during the North American winter, while offering rental income opportunities all year. Mazatlán is convenient to the United States and Canada, with frequent nonstop flight service to a number of cities. And, once you land at its international airport, you’re just minutes from your place on the beach. Yet, for all of its benefits, property prices in Mazatlán are reasonable when compared to Pacific beach properties elsewhere in North America or in most of Latin America. If you’re looking for a modern, beachfront home away from home that’s part of a well-appointed city, then Mazatlán is worth your attention. I’ve been to Medellín… the weather is not perfect. It RAINS a lot. The temperature is perfect, but that’s not the entire state of the weather… rain, rain, and more rain. Why don’t you mention that? I get an email like this at least once every six months, telling me that it rains in Medellín. It should be no surprise that when any place is described as “green and lush,” rain is usually in the picture. Even in January (Medellín’s driest month), you’ll get some rain—about 2.5 inches—so there’s never a true “dry season.” The driest time of the year is from December through March, when most showers are brief. Total rainfall is around 66 inches (1,673 millimeters), about what you’d get on the Gulf Coast or parts of Florida. The wettest months are October and May. Most rainy days have some sunshine. Often the day will start sunny, and then you’ll get one of those heavy, straight-down rains common to the tropics. Sometimes the sun will return and sometimes not. I often carry an umbrella unless we’re in the December to March period. I quite enjoy your weekly letters and read with interest on what you have to say about investing and retiring overseas because you and your crew can spin a pretty good yarn and make it seem like a dream life in the Americas. However I find something that tends to get overlooked is the language barrier and crime rate in some of the countries you recommend, for example, the Dominican Republic. I plan to retire this fall and those two concerns will ultimately decide where to hang my hat. These are two good issues: personal safety and language barriers. Generally, there are safe and unsafe areas in any country. And one of the criteria we use when deciding to recommend an area is safety… we simply don’t recommend places that are unsafe. To follow the Dominican Republic example, there are certainly dangerous areas in Santo Domingo; however, Las Terrenas—a place we recommend for expats—is extremely safe and several hours away from Santo Domingo. The same holds true in Medellín, Colombia—parts of it are dangerous. But I’ve found El Poblado to be safe day and night, even for women walking alone. Female colleagues of mine (women in their 20s, 30s, 40s, and 50s) travel there frequently and report never feeling unsafe walking alone in this neighborhood. So any destination you read about here will have passed that test. The language barrier is a bit trickier. I don’t know how old Ken is… but if he’s under 35 and open minded (or over 35 and open minded), he’ll add learning Spanish (or whatever his language of choice happens to be) to his list of things to do, attend a class in the first country he checks out, and then have all the Spanish-speaking countries wide open to him. I flunked French in high school, so I’m no language ace. But I managed to learn two languages after the age of 50… and it was well worth it to open up every country in the Americas plus a handful in Asia, Africa, and the South Pacific.